When I was thinking about the princesses to photograph for this project, Ariel was the first one I thought of. I spent my childhood watching The Little Mermaid over…and over…and over…. You could say she was my favorite Disney princess growing up. I knew I wanted Ariel’s hair to be simple. I envisioned big, voluminous curls with a starfish clip holding back her bangs. (Ariel is popular for those big bangs, yes?) 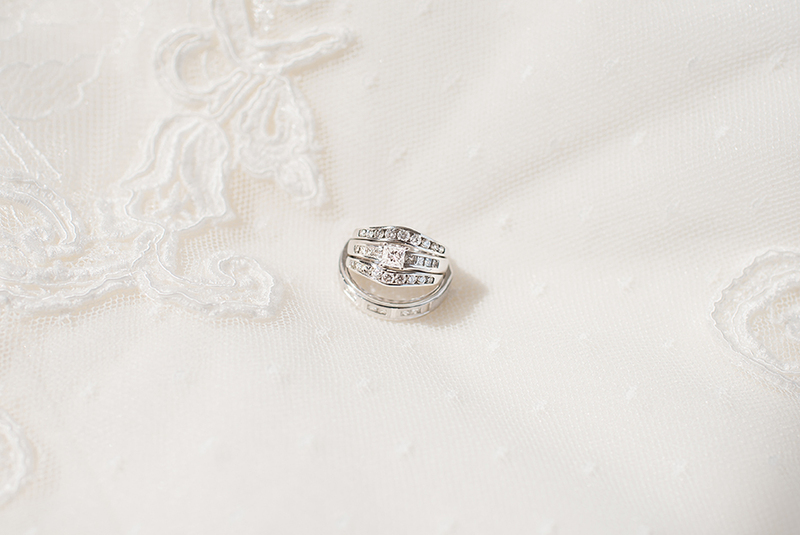 Also, I thought it would be interesting to add a little bit of a bridal touch to her outfit. 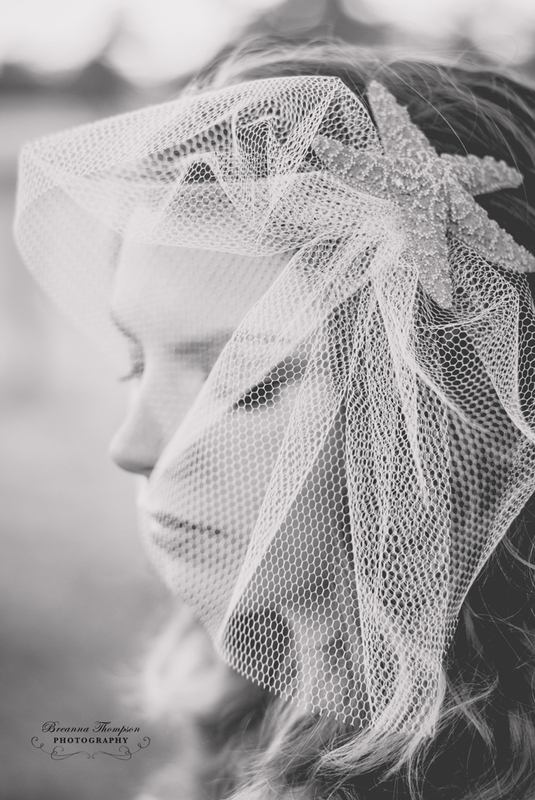 My goal with this shoot was to portray the princesses in a bridal/whimsical style, after all. 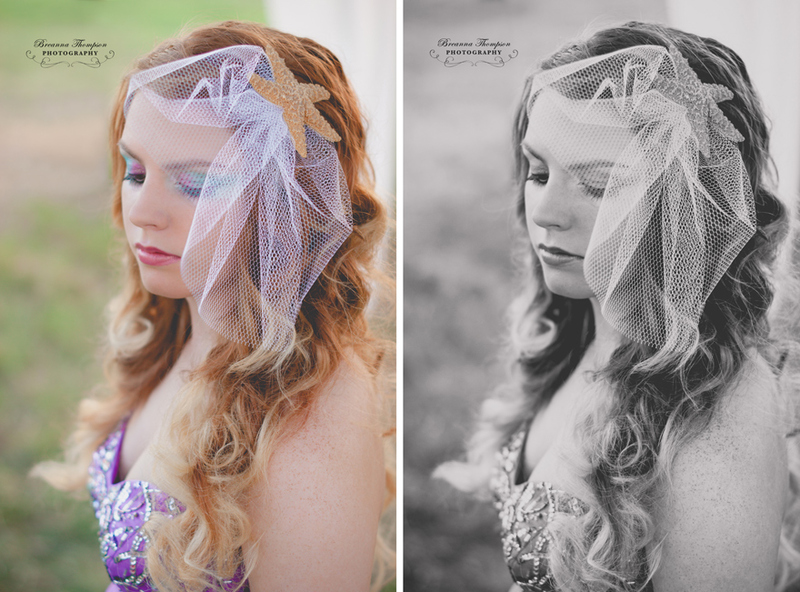 Therefore, we added a “fish net” birdcage to Ariel’s starfish clip and I think it was the perfect touch to her elegant, yet beach-y outfit! Of course, I knew I wanted Ariel to model in a mermaid shaped gown! I refused to budge on that and it took me a while to hunt down a mermaid dress in the right shade of purple. I was pleased that Ariel’s dress had a bit of glam with the beading on her bodice and down the back of her train. I think it added the right amount of texture to help envision the fish scales on her “tail” and the “shells” on her bodice. I decided to do something a little bold for Ariel and have her eye make-up represent the other colors of her outfit. When I mentioned this to Grace, our make-up artist, I was so excited that she was on board with the idea and I have to say, she did an AMAZING job incorporating the greens and purples for Ariel! In addition to photographing the Disney side of each princess, I also wanted to portray a few historically accurate tid-bits about each girl. So, here are some fun facts about “The Little Mermaid” and the time period it was written in: The original The Little Mermaid story was written by Hans Christian Anderson of Denmark in 1836. The Disney version of The Little Mermaid was brought to theaters in 1989. Even though Ariel’s attire does not reflect the Danish style of clothing in the 1830’s, the mermaid style dress does somewhat highlight the fact that Danish culture preferred a dress that accentuated broad shoulders and broad hips versus a narrow silhouette at that time. The 2 photos below were taken by Meagan Dean with Dean Quarter Horses. Is that chandelier gorgeous or what, y’all? 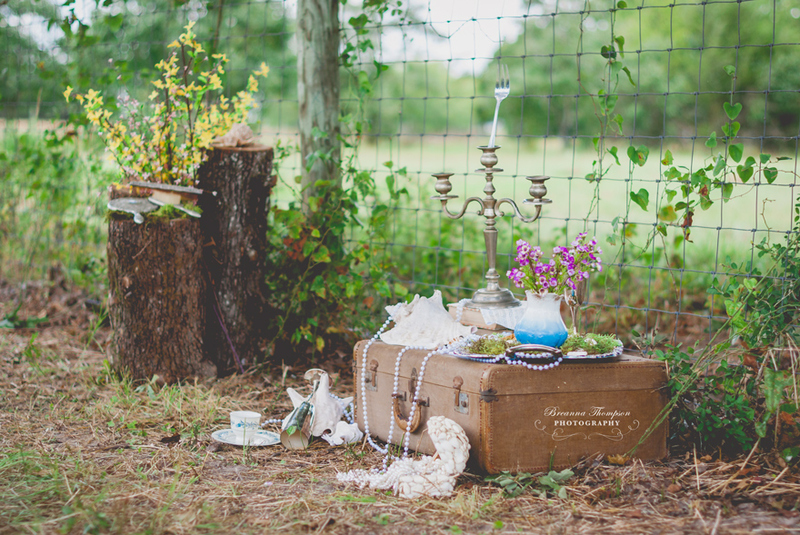 Tracie did an amazing job finding all the props for this shoot! Her fabulous sons, Blake and Brady, were so awesome at hanging everything up too! Awe so beautiful yay Cheyenne!!! Gorgeous! !! Love your talent. Love it!!! Great job everybody!!!! That was beautiful, that Baby Girl is beautiful. I love this shoot! These are beautiful poses and her makeup is too.